Ever since we got it 27 years ago, I’ve struggled with decorating over the bed. 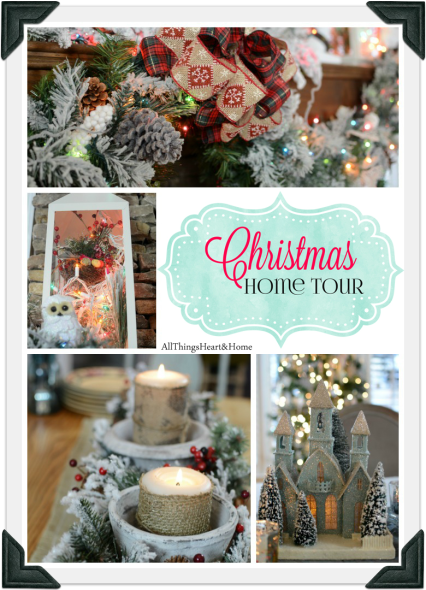 You heard right…this is a decorating dilemma that’s TWENTY-SEVEN YEARS in the making! 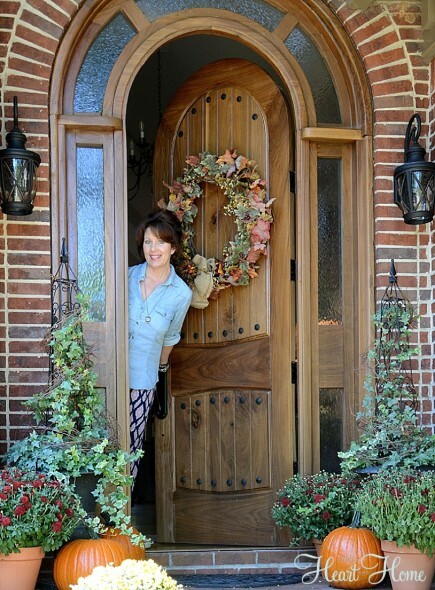 Spoiler alert…this antique Parisian mirror is what I settled on…after all those years. When we moved 4 years ago to our current home,(Stone House Lane House) our ceilings were higher and we needed something above the bed. I knew this lead glass piece wasn’t quite right in this space, but it was Mike’s 1st project when he started making lead glass, so it stayed here for a few months. Now here we are! I finally found exactly the right thing for over the headboard! YAY! But now I’m less-than-thrilled with the two other mirrors over the night stands! Got any suggestions (for what to put over the nightstands)? Should I paint the frames of those mirrors to look more like the BIG mirror? Or get something else? 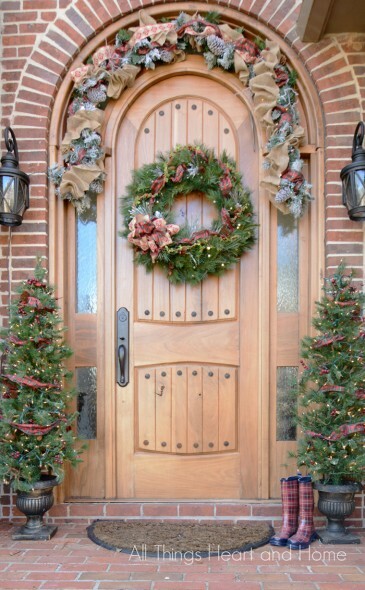 « 10 Amazing DIY Projects! As to what to do about the mirrors above yor lamps, I would try painting them the same color as your new mirror and then raising them to above your lamps. I know you won’t get the reflection of the lamp light, but you will get the reflection of the light from the window. 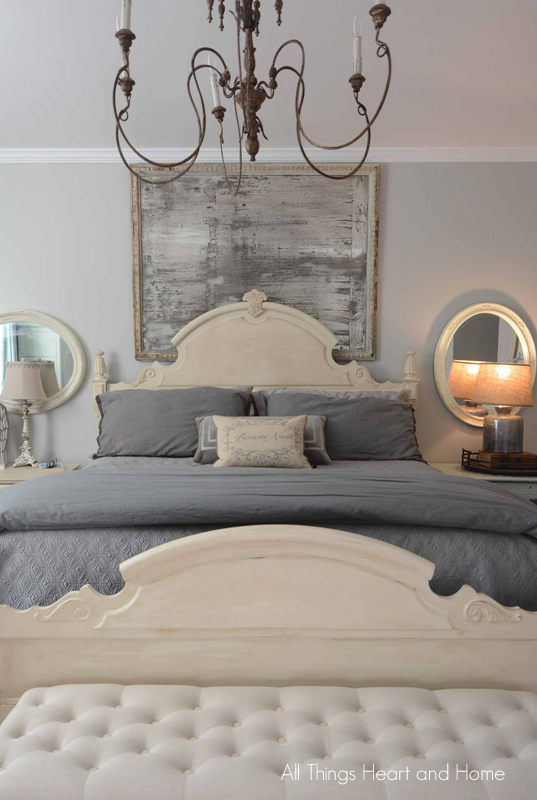 Hi Robin, I love the Parisian mirror for over the bed! Such a great choice. 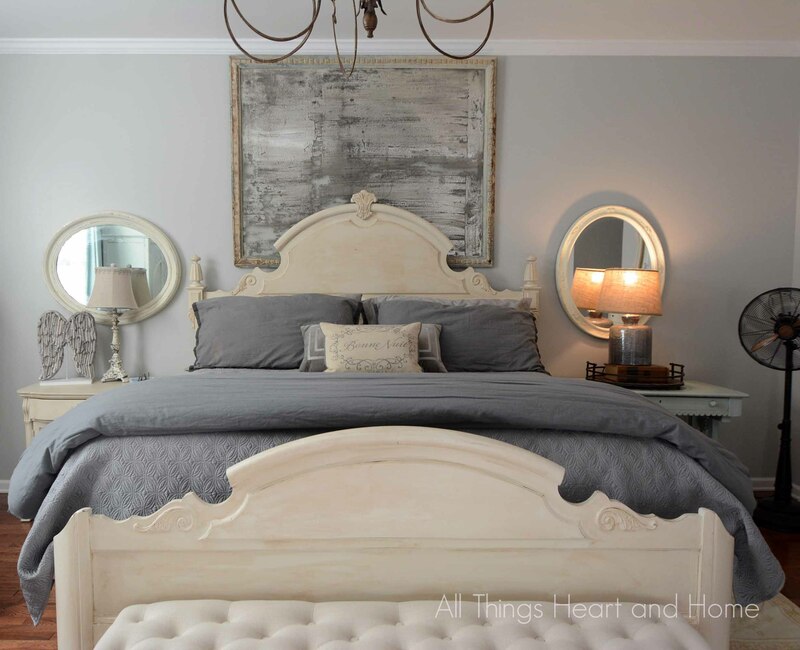 Maybe instead of using mirrors over the night stands, you could do black & white artwork from a local artist in frames that compliment the mirror frame. Tht would give you room a new look without a complete makeover. 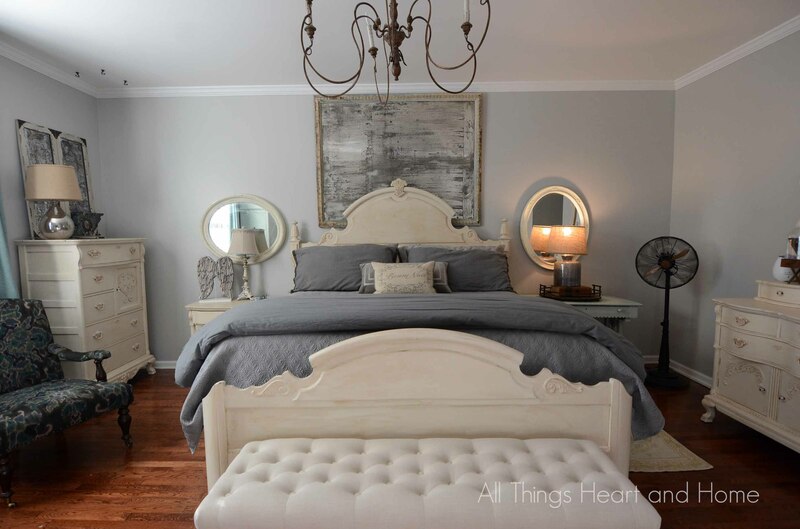 How about just eliminating the nightstand mirrors to give that beautiful antique mirror full impact. Sometimes less is more. I LOVE the mirrors over the nightstands! That’s the first thing that drew me in…and the picture over the bed too! I love it all and am going to post it to my inspiration board for my own bedroom! I initially thought the mirror was a picture, also, maybe that is why I thought the 2 mirrors looked fine with the night stands. Now looking longer at the pic I do think the frames on the 2 mirrors could be aged. Habe fun with this wall, black and white art or aging the frames! The mirror over the bed, is a perfect choice, Robin! As far as the mirrors over the nightstands, I would either hang them higher near the Parisian mirror or take them down and hang some artwork on either side of the mirror. Looking forward to seeing what you choose! It’s appears that those mirrors might be too low! Good idea about hanging them higher and if they don’t work…try art! Hi Robin….my suggestion would be raise the mirrors and spin each in the same direction. Raise them to middle of old mirror. The bed headboard is rather large, so after moving mirrors try using larger lamps for better balance, they seem to small for such a large headboard…btw I love the bed…good job on color selection! Have a great day! Maybe a pair of soft botanicals in place of the nightstand mirrors would help. You could definitely use a pair of larger lamps. Your bedroom is beautiful. Do you mind sharing were you got your bedding and the paint color you used on the wall? I love your bedroom. I think it looks very pulled-together. Your bedroom is simply stunning! I love what you put above your bed! It looks like something that I would do in my room if I had the space. I love it and completely enjoyed seeing how your room progressed over the years. The light pallet is definately my favorite! Super choice on the mirror as well! Isn’t it great when you finally hit on a design solution that just feels right? Love the bed in this reincarnation. As for the nightstand mirrors? My two cents? I think there is plenty going on with the shape of the bed and the new mirror you would be just fine taking them down and not replacing them with anything. love the way the bed turned out, what a transformation! thanks for sharing this on Dream, Create and Inspire. 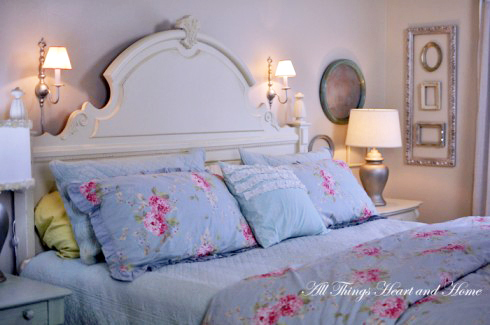 I have a high rounded headboard similar to yours that I truly love, but never know how to decorate around it. Thank you for some ideas. I avoid heavy items over the headboard because we live in earthquake country, but something at the side makes sense. Not sure I love the mirrors hidden behind the lamps. Raising them seems like the best solution if you love them. PS I like the idea of putting the heavy mirror behind the headboard so it would fall behind and not on our heads. I will keep this in mind when I decorate. It has been about 35 years figuring out what to do. Hi Robin. After all of this time, how in the world have I not been following your blog??? I have some catching up to do! Anyway, I love what you chose to go above your bed. It’s perfect in your room. I’m sooo glad to see how your furniture looks painted. 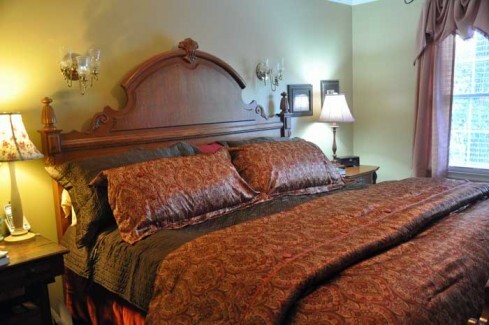 Our guest room has a set with curvy lines and details similar to yours. It’s very dated, but for some reason I couldn’t picture it painted. I recently added a pair of aged shutters above my night stands to solve a similar problem. I love them! 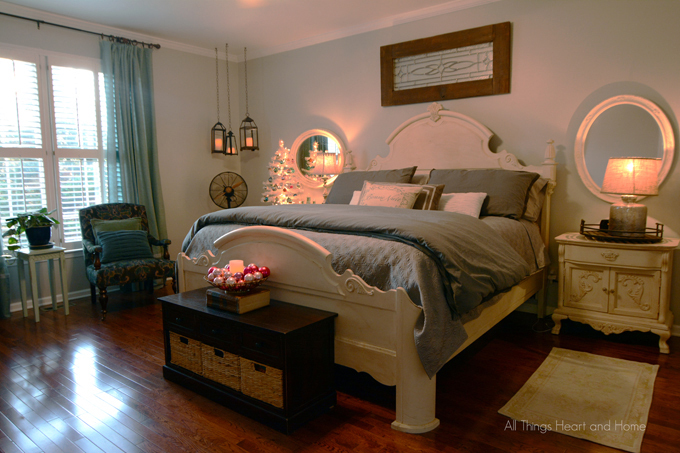 Just a thought…….your room is beautiful! Robin, I think your bedroom is beautiful. In my mind, I can imagine the two small oval mirrors replaced with long rectangular mirrors, the frames painted to match the French mirror. Perhaps two moderately-priced closet mirrors with better quality mirror from the very cheap ones?